Present state: Demolished - the track through the north part of the site is still in use serving the Stocksbridge Steelworks to the north west of Sheffield. Notes: Engineered by Joseph Locke, the Sheffield, Ashton-under-Lyne and Manchester Railway linking Manchester and Sheffield opened in 1845. Originally, this line terminated at the Bridgehouses station about 1 km to the west of the future Victoria station. In 1847, the Sheffield, Ashton-under-Lyne and Manchester Railway merged with two other railway companies to form the Manchester, Sheffield and Lincolnshire Railway. The station at Bridgehouses had been outgrown and an extension and new station were planned. John Fowler, who later gained fame for co-designing the Forth Railway Bridge in Scotland, was employed to engineer the extension and station. Fowler's design included a 40-foot high, 750-yard viaduct over the Wicker. The extension was completed in 1847–1848 and the new Victoria station opened on 15 September 1851. In its heyday was a rather grand looking edifice made up of two 'island' style platforms, with tracks running around either side. Spanning the platforms was a large glass and iron overall roof. 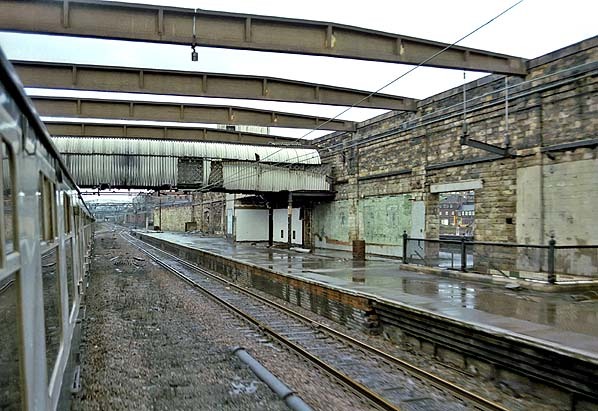 The station received a new roof spanning the main line platforms in 1867 and was enlarged in 1874, the well-known railway contractors Logan and Hemingway being awarded the contract. Adjoining the station at the end of Victoria Station Road was the Royal Victoria Hotel which is still open today. 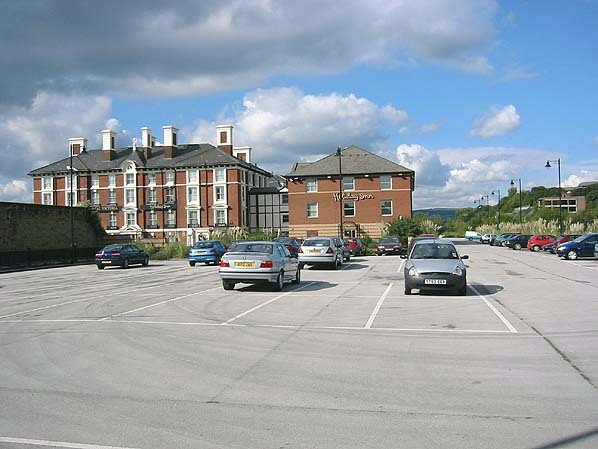 The station received a new frontage in 1908 and took on great importance when the line through the Pennines, known as the 'Woodhead Route' after the long Woodhead Tunnel on it which was electrified for freight purposes after World War II. 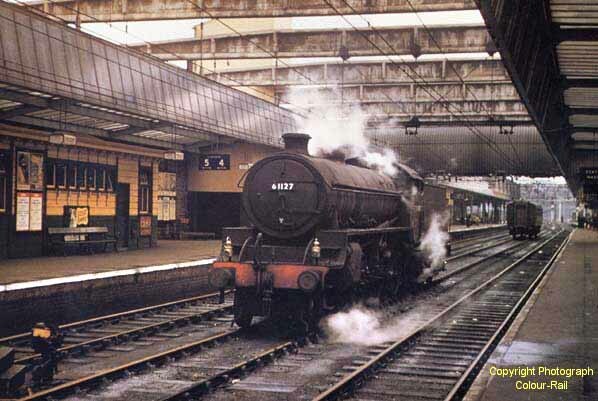 The 1950's saw the station at its zenith with a service from Manchester London Road - London Marylebone via Sheffield Victoria along the Great Central line, other expresses ran to London Kings Cross over the East Coast Main Line and the named expresses 'The Master Cutler', 'The Sheffield Pullman' and 'The South Yorkshireman' served the station. There were also many semi-fast trains running trans-Pennine from Manchester to destinations on the East Coast, and local trains to Chesterfield, Barnsley, Nottingham, Doncaster, Retford, Penistone and Lincoln. Tunnel was found to be too low and a new tunnel was bored to the south of the old one between 1949 and 1954. 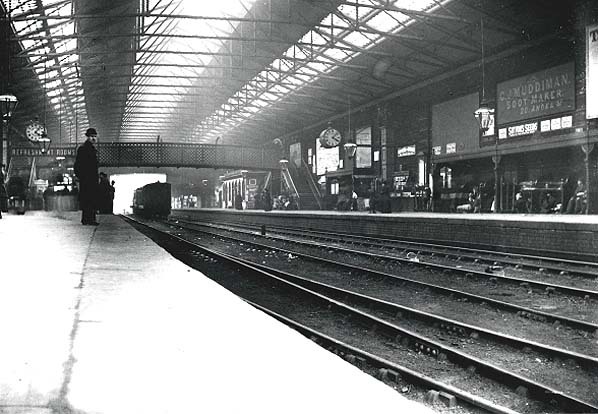 The electrification of the line reached Sheffield Victoria by 1954, reducing the journey time to Manchester to 56 minutes. This was the first main line in the UK to be electrified, but the only one at 1500 V d.c., a system which was already obsolescent. From this point onwards, all passenger trains heading to Manchester required a change of locomotive at Victoria to a British Rail Class 76 or express passenger British Rail Class 77. 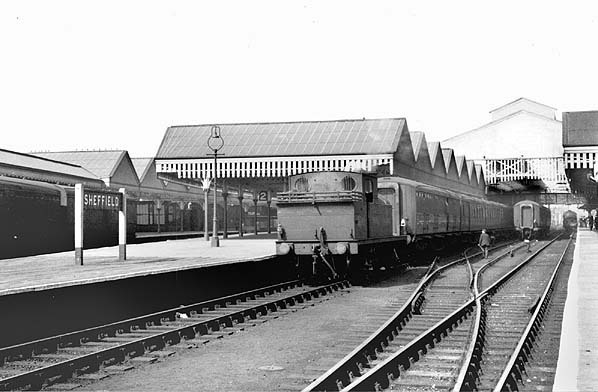 Although the 1950's saw services at the station reach their peak, this period also marked the beginning of its decline. As road traffic grew and the mills closed, the surviving coal trains became shorter and more sporadic in operation. In 1953 Barnsley was an early casualty as the line ran almost parallel to the former Midland Railway's Sheffield Midland - Barnsley line, serving mostly the same communities. By the end of the decade, the expresses to Marylebone were either cut or re-routed to Kings Cross (in the case of The Master Cutler). In the mid-1960's there was a concerted effort to concentrate Victoria's remaining local and express train services at Sheffield Midland, leaving Victoria with just an hourly Manchester service and the daily Liverpool-Harwich 'Continental'. Following public outcry, an enquiry was launched that took two years to be completed. Eventually the enquiry backed British Rail's plans and passenger services were withdrawn from the line on 5 January 1970. The last train to Victoria station, an enthusiasts' special, arrived at 00:44 on 5 January and from that point the station was closed. 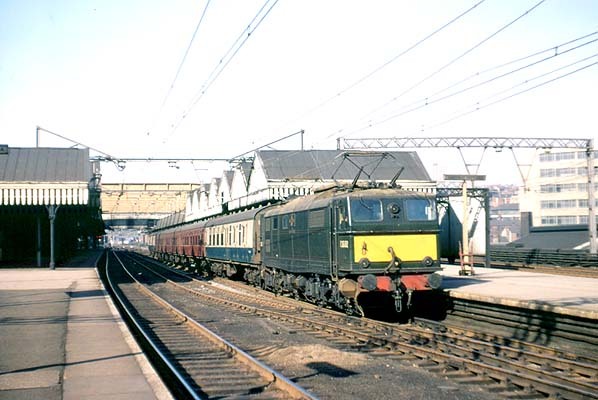 The station re-opened very briefly in 1972 for diverted trains while Sheffield Midland was closed for re-signalling. 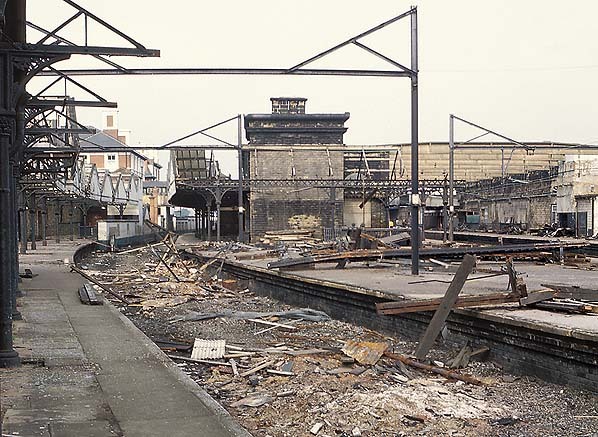 See the Lincolnshire & East Yorkshire Transport Review for additional pictures of Sheffield Victoria Station in the 1980's. The Manchester-Sheffield-Wath electric railway was entirely closed east of Hadfield in 1981; and the tracks through the Woodhead Tunnel were lifted in 1986. 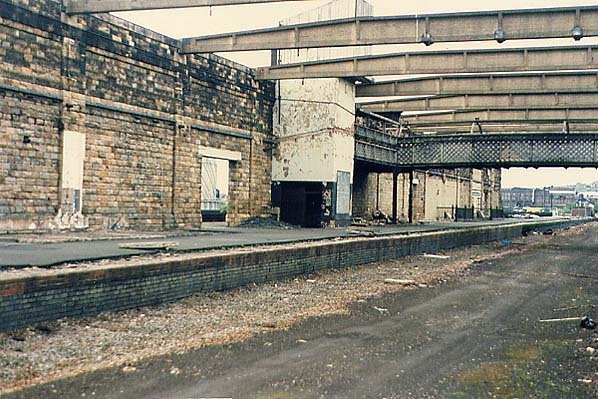 Except for the goods avoiding line, which still exists to serve the steelworks at Stocksbridge, the track through the station was lifted in the 1983 and the station buildings were demolished in 1989. In order to fulfil his ambitions, Watkin also became Chairman of the Metropolitan Railway who were in the process of extending their line northwards towards Rickmansworth and the South Eastern Railway connecting London with Dover. Initially, Watkin tried to convince other companies to build links with the MS & L allowing him to reach London but he was unable to reach agreement and eventually was left with little option than to build his own line southward from Sheffield to reach the Met. extension’ were built to a standard design consisting of an island platform with the booking office located on the platform. All the stations were built on an embankment or in a cutting adjacent to a road bridge, with access via stairs from the middle of the bridge; only the larger intermediate stations like Rugby and Loughborough had street level buildings. Because Edward Watkin also expected his trains to reach Europe through a channel tunnel, the line was also built to a larger continental (Berne) loading gauge. The Great Central opened for coal traffic on 25 July 1898, for passenger traffic to a new terminus at Marylebone on 15 March 1899 and for general goods traffic on 11 April 1899. The new line was built from Annesley in Nottinghamshire to join the existing Metropolitan Railway which had now reached Quainton Road in Buckinghamshire, where the line became joint Met/GCR owned (after 1903), it returned to GCR metals near Finchley Road for the final section into Marylebone. established north – south routes and the first train only carried a disappointing four passengers so the company had to work hard to win passengers from its rivals; with a well managed Advertising campaign and the introduction of a fast and efficient train service the companies fortunes slowly improved although it was never a match for its rival lines. transport enthusiasts set up the Great Central Railway (Nottingham) Ltd with the aim of redeveloping the derelict Ruddington Ordnance depot as part of a country park project. The depot was turned into the Nottingham Transport Heritage Centre (NTHC) and trains were run on a small length of line into the depot. Too see other stations on the Great Central Railway between Sheffield Victoria and Aylesbury click on the station name: Aylesbury, Waddesdon, Quainton Road (1st site), Quainton Road (2nd site)**, Calvert, Finmere, Brackley Central, Helmdon, Culworth, Woodford Halse, Charwelton, Braunston & Willoughby, Rugby Central, Lutterworth, Ashby Magna, Whetstone, Leicester Central, Leicester North***, Belgrave & Birstall, Rothley**, Swithland****, Quorn & Woodhouse**, Loughborough Central**, East Leake, Rushcliffe Halt**, Ruddington, Ruddington Factory Halt, Arkwright Street, Nottingham Victoria, Carrington, New Basford, Bulwell Common, Bulwell Hall Halt, Hucknall Central, Annesley South Junction Halt, Hollinwell & Annesley, Kirkby Bentinck, Tibshelf Town, Pilsley, Heath, Staveley Central, Renishaw Central, Killamarsh Central, Beighton (1st site), Woodhouse Junction, Woodhouse*, Darnall*, Sheffield Victoria & Sheffield Bridgehouses. 1890's - note the goods station to the north west of the passenger station. The goods station to the north west of Sheffield Victoria is the former Sheffield Bridgehouses passenger terminus. OS 1:500 Town plan showing the layout of the station in 1890. Click here for a larger version. A Class 77 (EM2) Co-Co electric loco No. 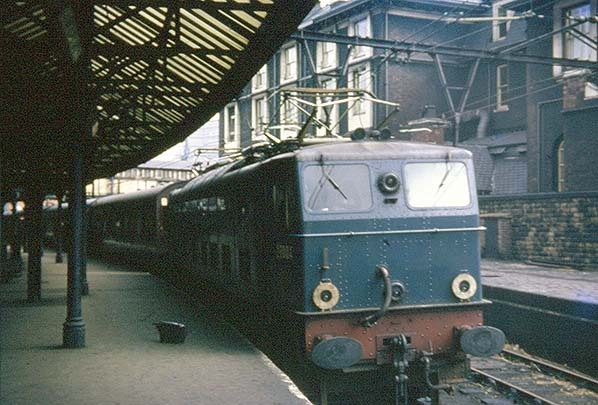 27004 is seen in platform 2 at Sheffield Victoria station late 1966 / early 1967. 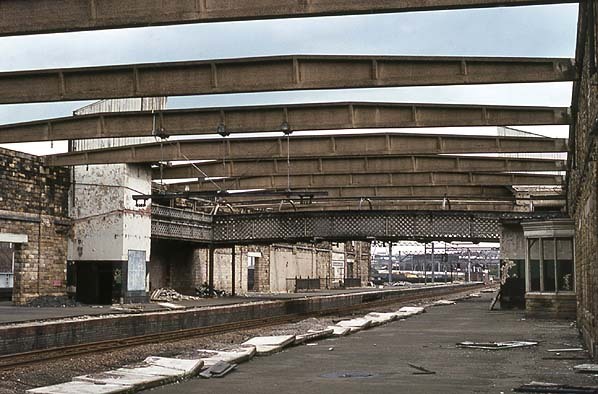 Sheffield Victoria Station looking west in 1980. The track on the far side of the station remained in use at this time. 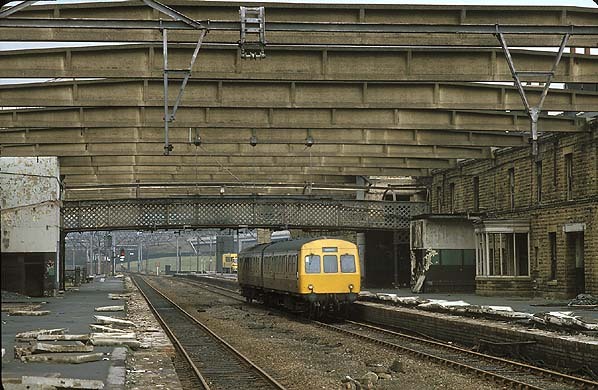 Sheffield Victoria Station looking east in February 1983. This is the Sheffield Midland to Huddersfield service which reverses to the east of the station passing through the closed Sheffield Victoria Station.